I am new to this forum and would request your views, suggestions, guidance for our forthcoming trip to Kumaon Hills in end May. We are a family of three. We are basically nature lovers and less inclined to visit religious places. I have short listed places of stay at Nainital (2 days), Binsar(1 day), Chaukori (1 day), Munsiyari (2 days) and Kausani (2 days). We would opt for a car to travel to all these places from Kathgodam and back. We would be staying at KMVN Rest Houses. Request your suggestion for places of interest to visit, based on our stay locations at Kumaon. Secondly, how is the climate in May end? Do we need to carry any winter clothes? We are also fond of exploring local cuisine. Can you please suggest some dishes that we should try and the eateries for lunch along the way? Breakfast & Dinner, I belive, would be best to have at KMVN RHs. Any other suggestion? What about mobile coverage? We have Vodafone & Tata Indicom connections. Will these work? Looking for your guidance to make the trip a memorable one. You have chosen all the right places. From your 2 days in Nainital, you can use one to visit Mukteshwar, its a beautiful place with great views. Binsar to Chaukori would take around 4 hrs. The best thing to do in Chaukori is to get up early morning before the sun is out, climb up to the observation post inside the KMVN, and watch the first rays of the sun light up the snow clad mountain peaks, its a sight you won't forget in a long while. Chaukori to munsiyari is about 5 hrs and the views just get better. You can keep a light woollen with you, may come in handy in chaukori and munsiyari. KMVN food is generally average, and slightly overpriced, sometimes you could get better and cheaper food outside. Machan at Nainital is a good option. With respect to food, however, since you would be on the road over long distances, it is always better to eat safe and not be too adventurous. Mobile connectivity may not be available for stages between mountains, you shouldn't have problems in the towns. I am planning to have a trip in Kumayon region for 12 days(except the train journeys from Howrah Station and return train journey to Howrah Station).I want to stay at Munsiyari(2 nights),Binsar(2 nights),Corbet Park(2 nights),Choukori(1 night),Nainital(1 night) and Koushani(1 night).Please provide me a detail iteration for this trip. Also please advice whether it is ok to stay at nainital for one night or need to stay one more night at Nainital? Day 1 is counted from the time you reach kathgodam railway station. Day 1- Kathgodam to Nainital by taxi. Spend the day in and around Nainital , including boating, ropeway, china peak. Day 2 - Go on a day trip to Mukteshwar. Day 3 - Go to Chaukori. Spend the night in Chaukori. Day 4 - Get up early morning and see the morning sun lighting up the snow peaks from the observation tower at the KMVN hotel. Leave for Munsiyari. Stay the night in Munsiyari. Day 5- Spend the day and night in Munsiyari. Day 6 -Head to kausani. spend the night in kausani. Day 7- spend the day and night in kausani. day 8 - go to binsar, stay the night in Binsar. day 9 - Spend the day and night in Binsar, go to zero point and the wild life sanctuary. day 10 -Leave Binsar, spend some time in Almora and head towards Corbett. night in corbett. day 11- day and night in corbett. day 12 - head to delhi and catch train from delhi to howrah. corbett to delhi is about 6 hrs by road. We are a family of 4 & planning to visit haridwar rishikesh binsar chaukori munsiyari kausani Corbett in d time span between 21 and 31 inclusive of both days we have around 11 days & nights our bookings at binsar & Corbett r confirmed on 25-26 & 30-31 respectively the rest of the itenary is getting confusing to plan... kindly assist & can we get snowfall in binsar & munsiyari,during our visit? Kindly suggest.. It seems you may have to exclude Haridwar rishikesh because of time constraint as you have a booking at Binsar from 25th. I presume you will start from Mumbai on 21st and reach Delhi on 22nd and reach Haridwar on 23rd. If you spend 23rd and 24th in Haridwar/Rishikesh, then you can head for Binsar on 25th. 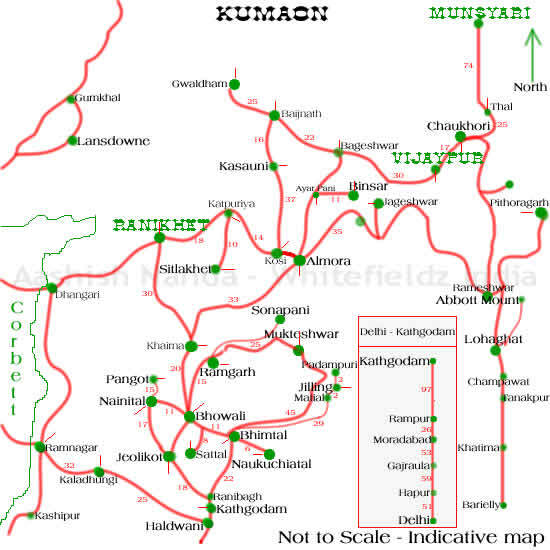 You have to either go by train from Dehradun to Kathgodam and onwards by road to Almora and on to Binsar , or go by road from Rishikesh to Binsar via Goaldham, Bageshwar. The road is fairly longish and slightly off track, so it will take a fairly long time (8-10 hours). Based on your bookings it is a tough ask as you will probably reach Binsar in the evening if you start early morning. Ideally, you should cover Chaukori , Munsiyari, Kausani and head to Binsar. from Binsar you should move to Nainital, you can also visit Mukteshwar. From Nainital, you should come down to Corbett. While staying in Nainital, you can visit all tals nearby, Pangot etc. While going to Almorah, you can visit Mukteswar (you can stay there too on 23 rd or on 24th instead of Almorah). From Kausani, you can visit Choukri. If you follow the route from Tanakpur (by train), Lohaghat - Abot Mountain - Mayabati- Mukteswar-Almorah-Binsar will be the route. I have bookings of train from Delhi to haridwar on 21 evening and then haridwar to kathgodam on 24 night i will rch kathgodam early morning on 25 I am reaching Delhi on 21 morning by Rajdhaani i have made sure to book all connecting trains...:) pls guide further i want to do this tour including Rishikesh as my family has been eagerly wanting to visit there..could i possibly squeeze in all the places as mentioned?? Swati, as you'll reach Kathgodam on 25th morning, you've to reach Binsar directly from there. 27 - Ranikhet, visit Kausani from there. .....could i possibly squeeze in all the places as mentioned?? squeezing in all the places will result in long journeys only. Swati, the places are so beautiful, they need your attention more than just touching and leaving the places. I agree with DJ, these places are so beautiful, you should give them a bit of time. But I guess, you wouldn't be going north from Mumbai regularly, so you would probably try to make the most of it. You will probably need a couple of days rest to recover from the tour, but hope you have a great time ! I would suggest a slight change from what is suggested by DJ above. My suggestion is leave out Ranikhet, it isn't worth it. I think you should try to stay in Kausani for a night, ie 27th, the views from the KMVN are fabulous in the morning. You can move to Nainital on the 28th. From nainital, pay a day visit to Mukteshwar, the route and the place are both beautiful. Visiting the other tals around nainital is not worth it. Wokay.....:D and what about chances of snowfall by expert opinion?? �� we were suggested dalhousie and khajjar for snow but we are interested in landscape too and its my stubbornness because of which we have itenary of kumaun region this time hopefully it goes as planned will keep you guys posted and thanks a heap again..three cheers for travellers worldwide..
you might get snow in Binsar and Mukteshwar, but it all depends on luck. I have seen snow in Nainital itself , so its all about being lucky.